In this project, we explored how we could augment the playground with mobile devices and create an engaging learning experience for kids. This project first started off as exploring augmented reality for learning. I started off by first researching the science standards for what students should be learning at different ages. I looked at the National Science Education Standards (NSES) written by the National Research Council. This provided me with a better understanding of what content students are learning at various levels. I drew inspiration from one of the lessons in the (NSES), which looked at teaching students about the periodicity of pendulums. The lesson was meant to be conducted inside a classroom and done in small groups. I redesigned the lesson that could either one student could complete it, or it could be done with multiple students using the same mobile phone. I looked at the SciPlay app produced by the New York Hall of Science. These applications also look at teaching students about science through activity at the playground. However, one of the largest issues that we saw was that the features are too opaque for the average lay-person to understand. An explanation for this could be due to the fact that this application is meant for students to use in a classroom setting, so in that condition they would have teacher guidance. One of the greatest takeaways from looking at the SciPlay application was that it needs to be as simple as possible to allow anyone to step through it without any guidance because if it is too complicated, it will deter people from using the application and eventually they will abandon it. 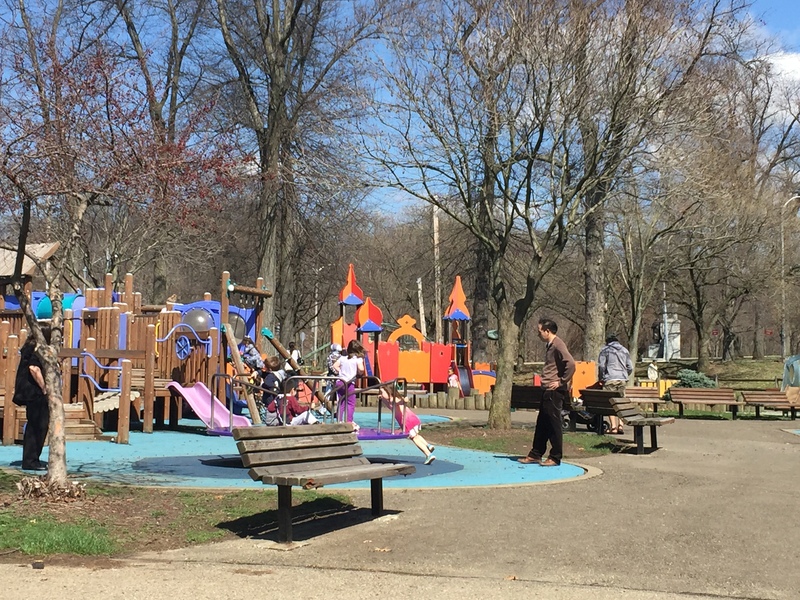 We travelled to Anderson Playground in Schenley Park, adjacent to Carnegie Mellon. What’s unique about Anderson Playground is that it has signs with science lessons on them for three activities: the swings, the merry-go-round, and a spinning pole. Beside each of these playing apparatuses, there were short descriptions that gave explanations about the science related to the apparatus. For example, for the merry-go-around, it talked about the “fast area” being the outer ring of the merry-go-around and how you cover more distance in the same amount of time. In some senses, these signs are the pre-cursor to the augmented reality application that could accompany this park. While we were at the park, we saw that the age group was lower than our original target age group of middle schoolers—most of the children there were early elementary school students or not of elementary school age. While we may have seen a larger range of ages at a different park or at a different time, it is also probably unlikely that middle school students would frequent the park. When we talked to the parents there and asked them about their engagement with the signs, they said that they may have looked at it once or twice when they first brought their kids to the park, but after that they ignored them. We then asked them their motivations for bringing their kids to the park. Many of them said that it was mostly so that they could relax for a bit while their children ran around and burned off energy. When we gauged their interest in having a science learning experience for their kids at the park, they did not express particular interest. These responses were a bit discouraging, but it also made me think of the project in another way and raised some questions about how we could best introduce the application. What would in fact compel children and their parents to use the app? One of the ideas I had was that perhaps this is an application that should first be introduced in the classroom. This isn’t to say that it should be like the SciPlay app, as the SciPlay app has too many complexities that are hard for a student to figure out by him or herself. The first-time usage for this augmented reality learning application would be in the classroom. The teacher can use it for a classroom activity or even for a fieldtrip activity to a local park. How I’m envisioning this is that schools would also have mobile devices that they could lend out to students, akin to a laptop cart at school where students can borrow laptops. After being introduced to the application at school, we hope that students will be engaged enough with it that they will continue to use the application at home, and possibly getting their parents to collaborate with them on some of the activities. An idea that we also wanted to explore through this project was the addition of an augmented reality learning experience at the local swimming pool, the Schenley Swimming pool in Schenley Park. There are inherent challenges, such as how mobile phones and water don’t mix well, but also what would compel people to use the phone while they are relaxing by the poolside. Let’s first address the water and mobile device issue. A remedy to this concern would be to have waterproof cases available for loan at the community pool. While there are some initial costs associated with procuring these cases, they will ultimately be worth it because it will provide people with peace of mind knowing that their phone is safe. An activity that I thought of but have not prototyped is to look at the diver’s form and the splash that they make. We can have people explore the diver’s moment of inertia and angular velocity by evaluating their form and seeing whether or not it affects the amount of splash they create. To create even more engagement, we could also use the application as a way for people to “score” people’s dives, just like in a diving competition in the Olympics. What is the learning goal of the lesson? How can we measure learning outcomes? What are the important aspects to measure? Is it more about learning content or piquing interest? What does the current lesson look like without the addition of augmented reality? Where are existing systems failing? What is the value added when using augmented reality? Why will a child feel motivated to use this augmented reality system? How can we keep the content dynamic? How can we make sure that users are still engrossed with reality and not overtaken by the augmented reality. E.g., looking at the world through the camera of a mobile phone as opposed to just experiencing the world as it is without a filter? What social aspects could be introduced? Could we connect parents/kids together who are at the park at the same time and both have the app? Besides science learning, what other things could we introduce?